Good afternoon…it’s gray and murky out there but temperatures are around 50° early this afternoon and the warmth will continue for the next day and a half…into the wee hours of Monday morning before a seasonably strong cold front comes through the region. This front will send the mild air away and it won’t come back for awhile as more seasonable cold comes into the picture. The next storm to watch will be towards Wednesday and Thursday…and that one may create issues with ice and backside snow. Oh and the Groundhog in Pennsylvania today predicted and early Spring for only the 19th time in 133 years. It’s not happening with any regularity for the next 10-14 days though. Enjoy the taste of spring this weekend. Monday: Midnight high in the 50s…falling AM temperatures to the 30s after daybreak. Gusty NW winds of 15-25 MPH will bring in that colder weather. Skies will turn mostly sunny and that will help level off the temperature fall in the afternoon. Temperatures (in the red numbers) are well into the 50s and close to 60° all the way down into OK. That fetch of moisture and warmth will continue to come northwards today into tomorrow. Clouds will hang tough with potentially some thin spots every so often. 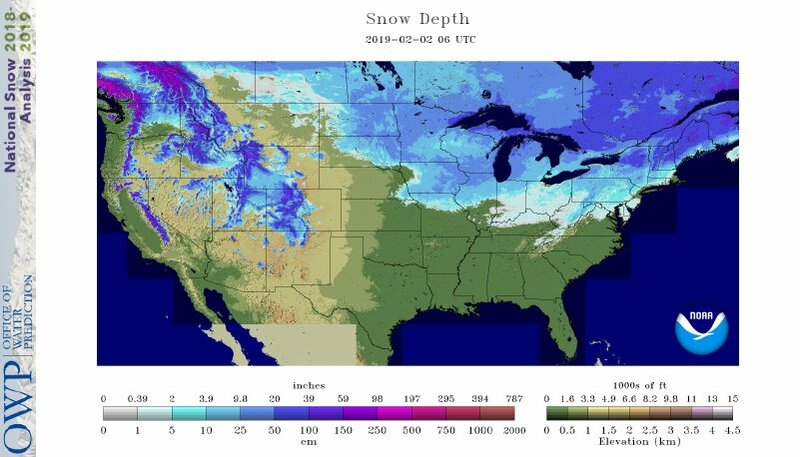 37% of the nation is under snowpack. Interestingly with the snow we saw a couple of days ago…we’ve now cracked the 17″ mark…17.6″ officially. Over the past 3 winters we’ve had about 19″ of snow…so we’re rapidly closing in on having more snow this winter compared to the last 3 winters combined. By the way…January ended up below average (by less than 1°) for temperatures up at KCI (the official station for KC). The fascinating part to that was that it would’ve been a normal month (or above) if it wasn’t for one day, the 29th). That day alone was 30° below average and that took off one degree from the monthly average on it’s own. The end to this brief respite from the cold comes 1st thing Monday morning as a seasonably strong front knifes through the region near daybreak. Colder air will spill into the area Monday and while not terribly cold…it’s a return to winter. Of course this will be at the surface…above us things are not as cold…and that could be an issue coming down the pike. What’s going on? Well the front on Monday will make it down to about the I-40 corridor…the issue is the air above the front…from about 4000 feet upwards for a few thousand feet. There the air will NOT be replaced by colder air…it’s staying well above 32° up there. Why? Because while the winds in the lower few thousand feet of the ground are towards the north bringing in cold air…the winds 5000 feet upwards aren’t switching…so the warm air that’s upstairs now…never leaves the region. It’s sort of tough to graphically show…but let’s try using this diagram. It’s called a meteogram and it displays various features in one self contained image. For example the one below shows the temperatures of the atmosphere (off the model)…the relative humidity (shown in the green shading)…wind directions and speeds of the atmosphere as you go upwards…surface wind direction…I sketched in the cold front for you…and a bunch of other stuff. It’s a somewhat simple quick look at the atmospheric forecast. For time purposes..12Z is 6AM and 00Z is 6PM…now my added in stuff to talk about. There may be a storm coming out of the western part of the country. I don’t want to waste a lot of time on that storm yet…will get more into that tomorrow. I’m NOT forecasting an ice storm at this point…we may be able to get above 32° even at the surface on Wednesday…so whatever falls may just be liquid instead of ice…then in time on Thursday that warm air aloft will be wiped away and colder air comes back during the day. We just need to watch the situation for a few days…I recognize that something “wintry” could happen WED>THU…I lean towards a NOT big deal event on Wednesday (right now) but I also know that temperatures may be close to 32° Wednesday and that would need to be monitored. I do expect a decent shot of colder air to come into the area Thursday into Friday. NOT like last week…but cold. There are players on the field for winter mayhem…not sure at this point if they want to play together right now or if this ends up just not coming together in time for us…again MANY days away…so lot will change I’m sure. We are vulnerable to a lot of winter weather though of the next few weeks (at least). Cold air will never be that far away…and he milder air will be to the south of here mostly…so that set’s up a storm track through the Plains…and that could turn VERY interesting down the road. Our feature photo comes from ‎Deb Welch-Buchanan from a few days ago where folks were making frozen bubbles. She did and caught a snowflake on it to!